We had a quiet weekend, hubby played golf and I spent time in my sewing room. I chose Jenny Doan’s Tumbler quilt pattern, the shape reminds me of of many of the glasses my step daughter decorates. The tumbler quilt was easy to assemble. I used a Moda layer cake – Mixologie by Studio M. I love the modern prints and colors, especially the coral and yellow. I used my walking foot for quilting, simply echoing the seam lines. I backed the quilt with a gray Minky – it is super soft! The quilt measures 55 x 78 inches – perfect for snuggling! Until next time Happy Sewing! I finally finished my wonky Red Cross quilt! I’m so appreciative that Patty at Elm Street Quilts hosts the challenge One Monthly Goal. The challenge definitely motivates me to finish a project as well as seeing what other creative souls are doing! Win-Win all around! I started piecing this project sometime in 2014. I had left over 10 inch squares from the layer cake Shades of Black by Me and My Sister. I was drawn to this collection for the cool black and white prints. I decided to use scrappy red fabrics to create the plus/cross sign. During the planning process for this project my vision was using the quilt as a wall hanging in my guest bedroom that we’ve decorated in black/white and red. To create the wonky cross I used the slash method Amy Gibson taught in the Craftsy 2012 Block of Month course. I made one cut on each 10 inch square at least two inches from the edge either horizontally or vertically, inserted a 2.5 inch strip, then made a second cut in the opposite direction to insert the second strip. Very little waste with this method. My quilt measures 43 x 55. I’m happy the wonky red cross quilt is finally finished and hopefully will find a home for it soon! I plan to work on my patriotic UFO’s this week — what are you planning to work on? I’m choosing one of my easier UFO’s for April’s One Monthly Goal. 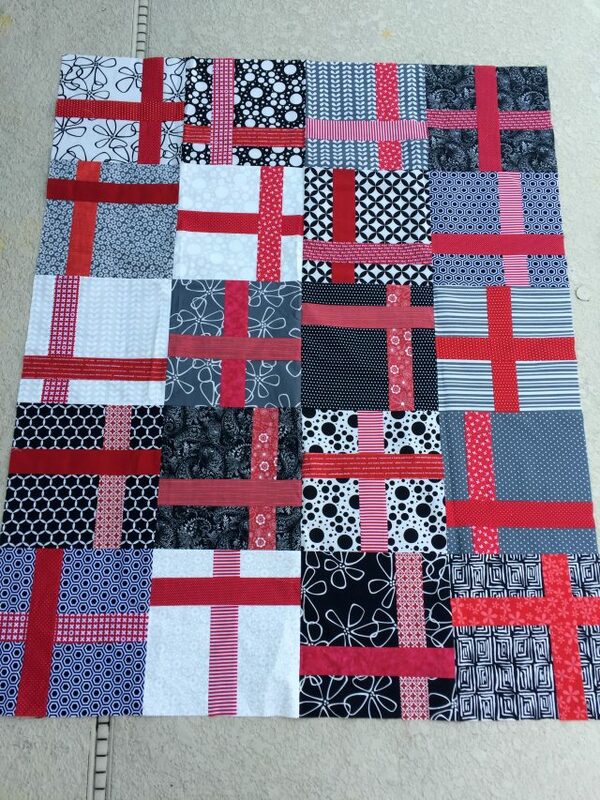 It’s a wonky cross quilt using left over 10 x 10 inch squares from the Me and My Sister Layer cake Shades of Black. I believe I started this project sometime in 2014. My goal is to use some of the techniques I learned in Angela Walter’s “Dot to Dot” Craftsy class. 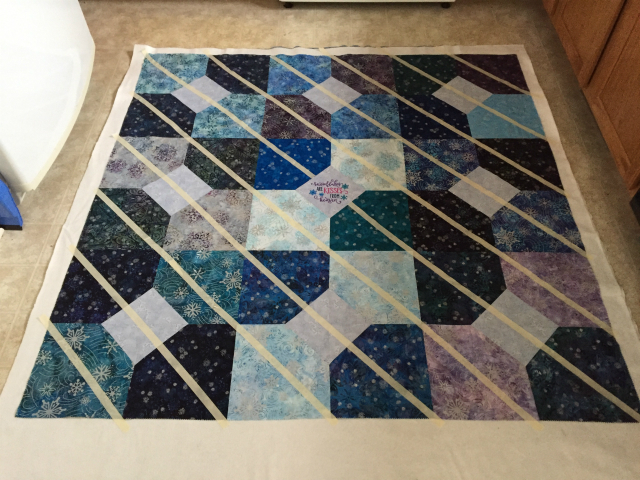 FMQ (free motion quilting) really scares me…. To prepare myself I made a set of placemats to practice my stippling. Normally I am a warm colored kinda gal but I decided to step out of my comfort zone and try soft pastels! Voila set of 4 free motion quilted placemats — not bad?? Until next time Happy sewing and quilting ! I’m sure everyone is crazy busy with Christmas quickly approaching! We are not traveling this year nor are we hosting a Christmas gathering this year, so we’ve decided not to decorate outside and unfortunately have become the odd ball house in the neighborhood. I gave away all of my Christmas decorations before moving not realizing how expensive it would be to replace. I’m waiting for the end of season clearance pricing so I can start over and be prepared for Christmas 2018. I am a big fan of Kate Spain, especially her Christmas fabric lines – Joy, Solstice and Jingle. I love her modern prints in bright red and greens with a splash of aqua. 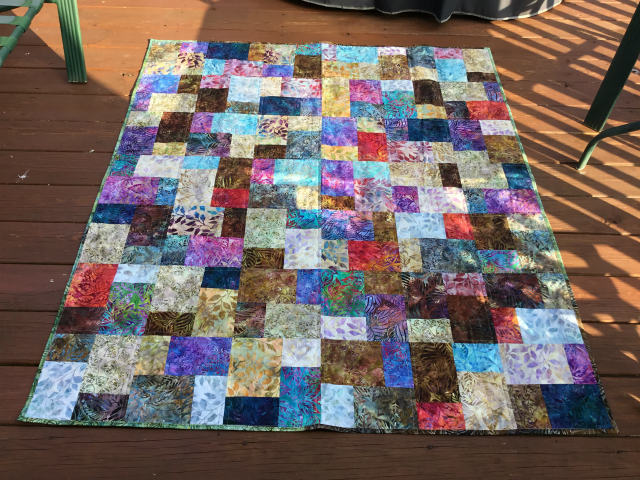 Last year I made a table runner, quilt and pillows using Joy and Solstice. I still had a layer cake of Jingle in my stash and decided to make a few more items in the same color way. This was the year I had planned to make Christa Watson’s Modern Christmas Trees wall hanging. Unfortunately the quilt along tutorial was no longer available. Using 15 ten inch layer cake squares below I sketched out my own triangle in a square modern tree design. The only positive thing I can say is it’s finished— the individual “tree blocks” were simple enough to create and measured accurately. My math was off on the calculations for the background fabric side pieces for completing each row. The design shape still resembles a tree but not what I had hoped it would be. I will definitely chalk this one up to experience. To get the larger triangle in square blocks I used my Creative Grids Triangle Squared and Perfect Rectangle rulers. You don’t have to have both rulers to make the modern tree block but there is less fabric waste using the set as a companion. These Creative Grids rulers are similar to the tri recs ruler which I used to create the wall hanging below last year. The creative grids perfect rectangle ruler offers an additional notch for perfect placement making the triangle in a square block super easy to create. 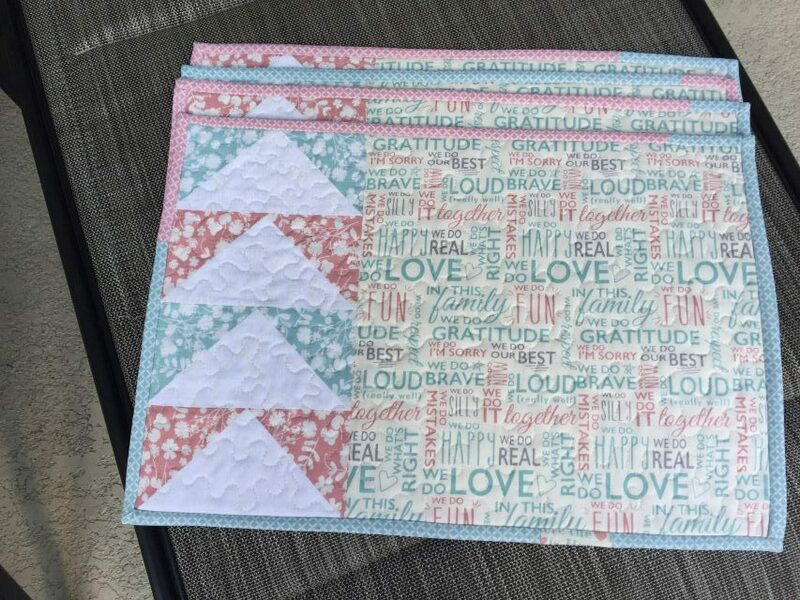 After cutting the triangle shape from my ten inch squares I had the following scrap pieces. I can’t wait to show you how I used those scraps! One of the quilt patterns on my to do list was the Layer Cake Lemonade; this quilt pattern is also from the Fat Quarter Shop short cut quilt series. We had our conversation on Tuesday and she wanted the quilt before her Saturday visit. Digging through my totes I found my Fresh Air Moda layer cake. Fresh Air is a 30’s reproduction print in very bright and pastel florals. On my pattern to do list I had noted that the layer cake lemonade didn’t require any background fabric – which made the pattern selection a no brainer. I had the quilt top finished Tuesday evening. Deciding which prints to use took more time than the actual cutting and stitching. I used muslin for the backing with a bamboo cotton blend batting. Simple quilting with my walking foot. Quilt measures 48 x 62 inches. Third finish for 2017! Nothing like waiting to the last day to reach a goal! Finished is finished and I’m happy to have my second finish of 2017. Layers of Charm is one of my favorite quilt patterns from the Fat Quarter Shop. This pattern is part of their short cut quilt series and believe me this was super easy to make. The pattern requires one layer cake and one charm pack. Not only do you get the free pattern you can also watch this video where Kimberly demonstrates how to make one yourself. The pattern includes instructions for many sizes including a table runner! I used the Robert Kaufman Artisan Batiks – Noel Metallic layer cake and yardage from the Robert Kaufman Fusions line as my “charms”. I added a little embroidery to the center of one block. 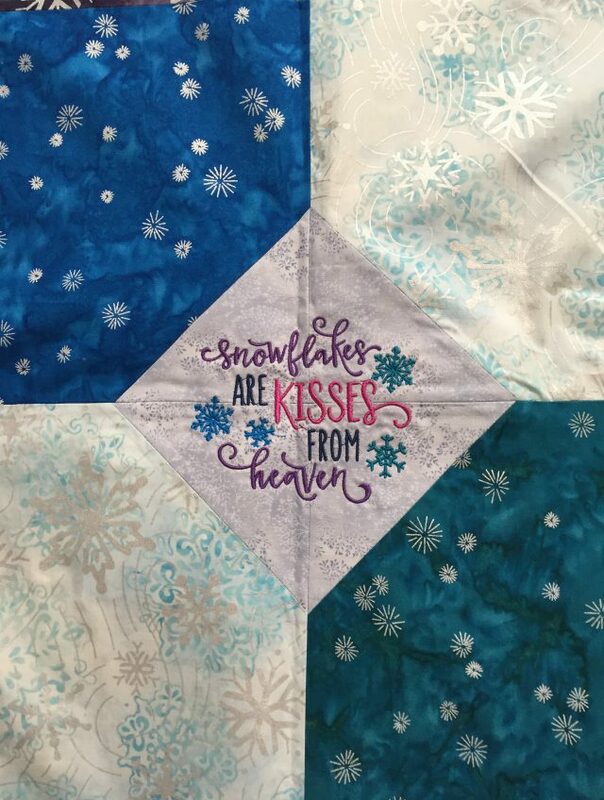 The prints of the layer cake have a winter theme including snowflakes so I chose a design that would complement the fabric. I purchased the design from Embroitique. I keep a journal with walking foot designs and decided to try the double parallel straight lines with this quilt. I used my favorite masking tape technique for marking. After washing my quilt measures 57 x 57 inches. I’m linking up with Patty of Elm Street Quilts for the OMG Challenge Finish. 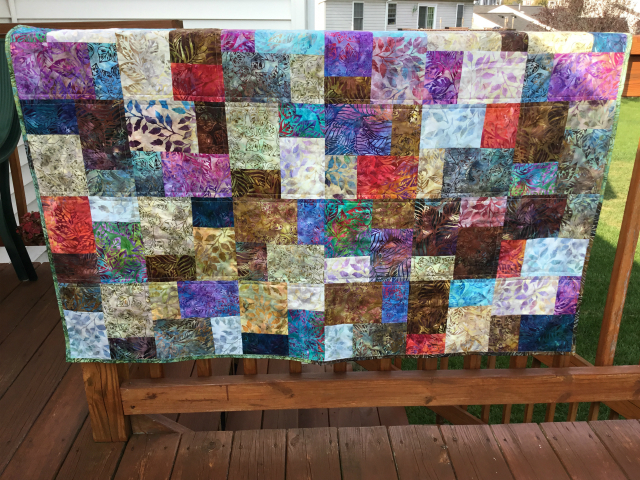 Be sure to stop by to see the lovely projects other quilters are working on for inspiration. I’ve been spending time going through my fabric containers making a list of projects I can realistically start/finish before we move in June. I came across these six petal blocks I’d made sometime last year. I decided these would make a great table runner. The fabric is Gardenvale by Jen Kingwell for Moda. The prints are funky, modern and retro and the colors are beautiful. 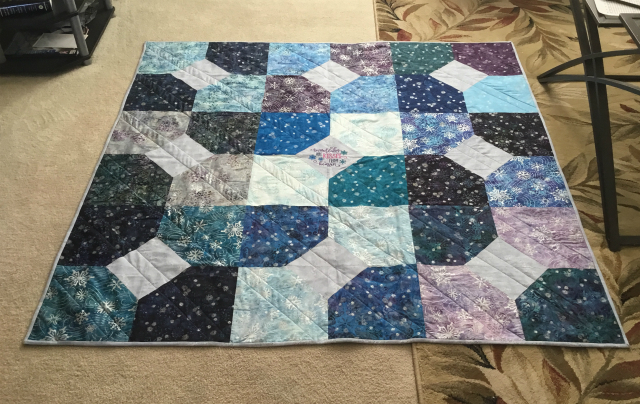 I used ten inch squares cut into four – 5 inch squares with 2.5 inch squares to create the diagonal corners which gives each block the the petal look. Needless to say I thought I was done! I was going through one of my large drawers that I keep supplies for my Etsy shop and found 3 more petal blocks — do you ever misplace quilt blocks? I figured nine block would make a great wall hanging, and I really need bright spot in my sewing room. Adding the three additional blocks created a new problem – I didn’t have anymore of the fabric I’d used for the cornerstones. I found a scrap Cotton & Steel jelly roll strip in black that matched. I truly hate ripping out stitches! If you would like to make a similar table topper or wall hanging Allison Harris with Cluck Cluck Sew has a great tutorial name Floret Table Topper. It feels great to have something checked off my to do list! 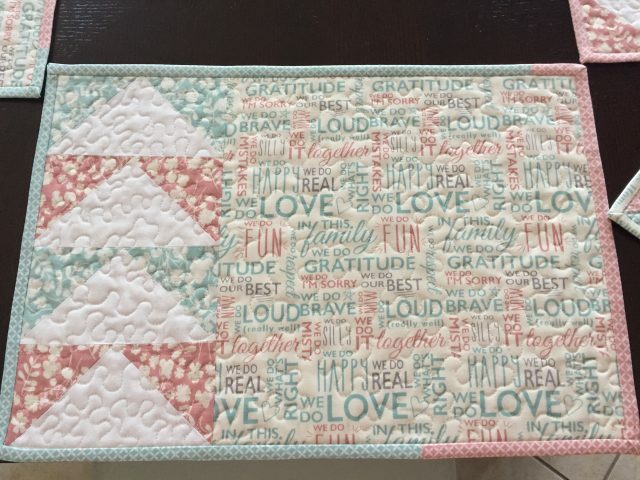 I still consider myself a quilting newbie so I don’t have lots of UFO’s – instead I have lots of fabric with magazine clippings or handwritten patterns attached. I am participating in the 2017 All People Quilt UFO challenge , using the chart provided to list my project goals for 2017. Kim graduated from Northwestern University whose school colors are purple and white. When I saw the Jenny Doan Starburst tutorial I knew it was the perfect pattern for my V&Co Simply Colorful – Purple layer cake. I love fabric with text prints. I used Inspirational Words by Whistler Studios for Windham fabrics for the quilt backing. Seeing the words ” Believe in Yourself”, “Smile, laugh, love”, ” Today is a new day” are so encouraging! The quilt measures 59 x 59 inches. I’m still not confident enough with my FMQ abilities so I did straight line quilting with my walking foot. I’m linking up with Lindsey of Fort Worth Fabrics and her Fabric Frenzy Friday. 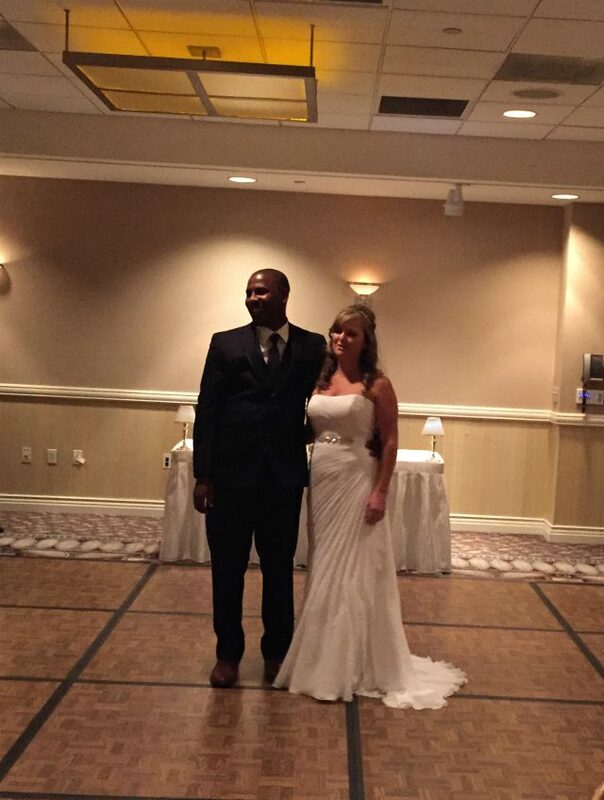 This past October son #1 married his lovely fiancee. It was a beautiful celebration for both families. They had a Las Vegas destination wedding. 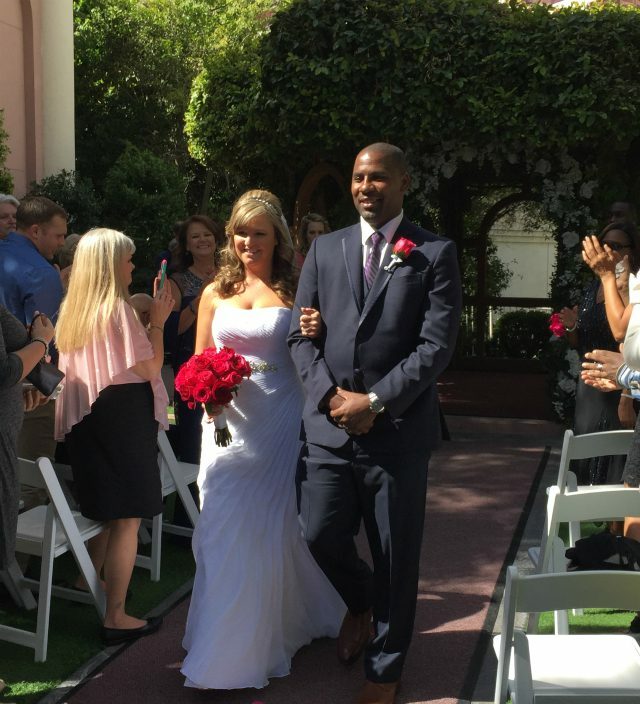 The ceremony was held in the Garden Chapel at the Flamingo Hotel. The chapel was most definitely a tropical setting with waterfalls, palm trees, flowers, trailing ivy and of course lovely flamingos! 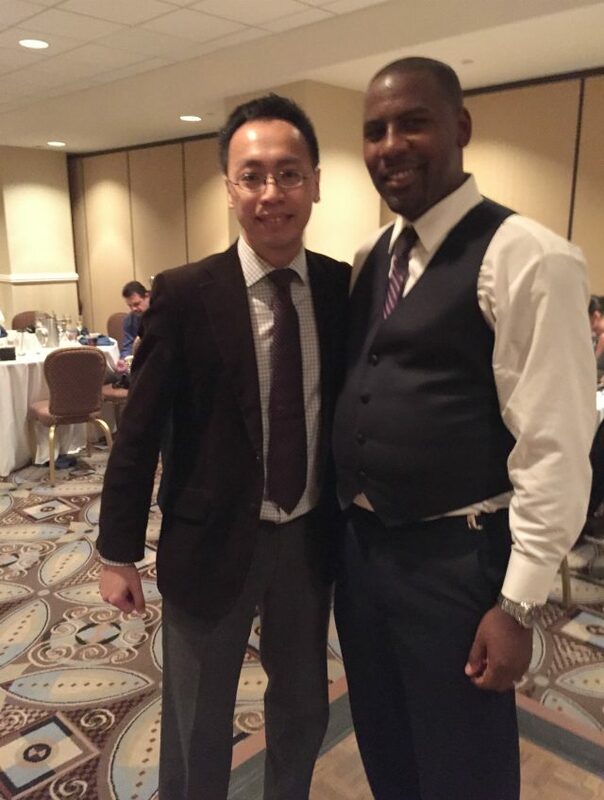 George and Heather shared their special moment with 45 friends and family — My son’s good friend from Taiwan was able to attend. It was such a pleasure meeting and spending time with him. 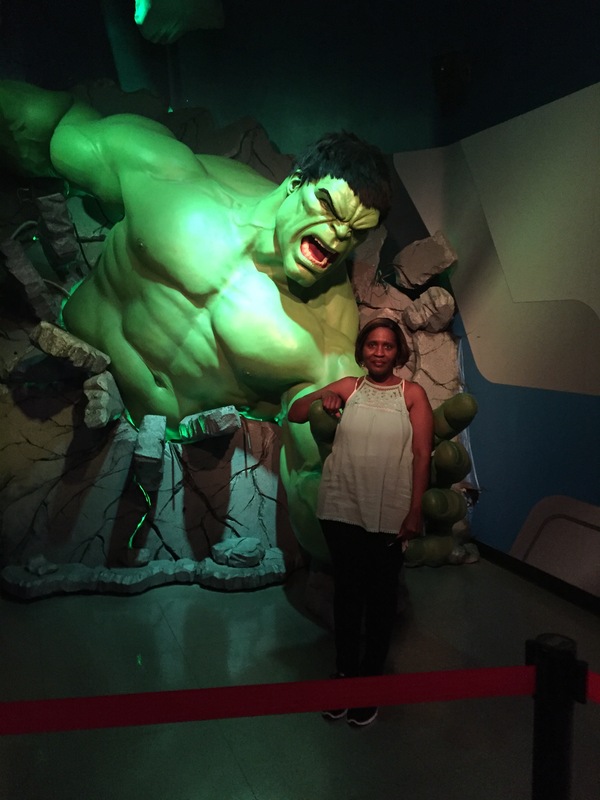 I hadn’t been to Las Vegas in several years and it was my husband’s first visit; so we planned a vacation around the wedding. 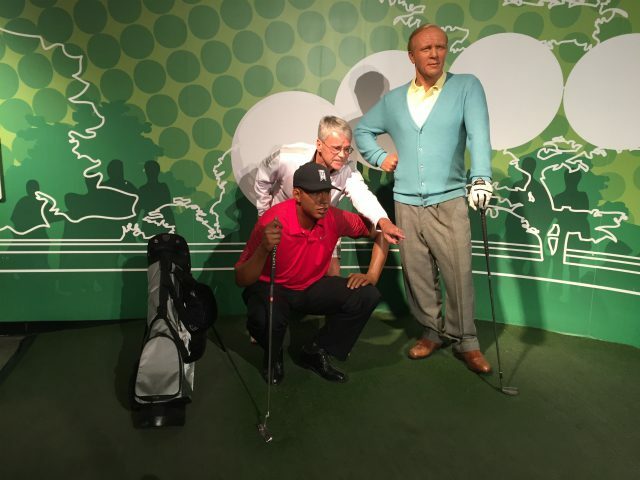 We visited the really awesome Madame Tussauds wax museum, toured both Hoover Dam and the West Rim of the Grand Canyon. The kids bought a new home in April. The basement is my son’s “man cave” and is decorated in earth tones. I made a quilt for them to snuggle under while in the basement. I used the Double Slice Quilt Pattern one of the many inspiring tutorials from Jenny Doan with Missouri Star Quilt Company. This was a great pattern for me being quilting newbie. Double Slice is super easy and pretty quick. 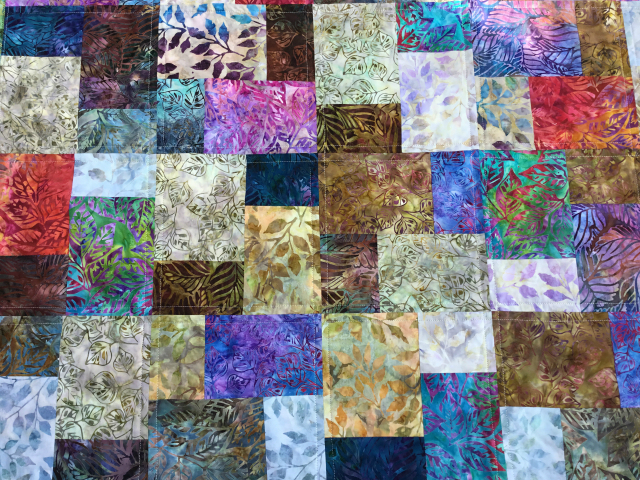 I used one layer cake – Robert Kaufman’s Grove Artisan Batiks for my 50×60 quilt. I fell in love with all of the fabric — the colors of the leaves match each season! My hope for George and Heather – may their love continue to grow as each season changes. I definitely plan to use this pattern again — adding borders to make it a little larger. 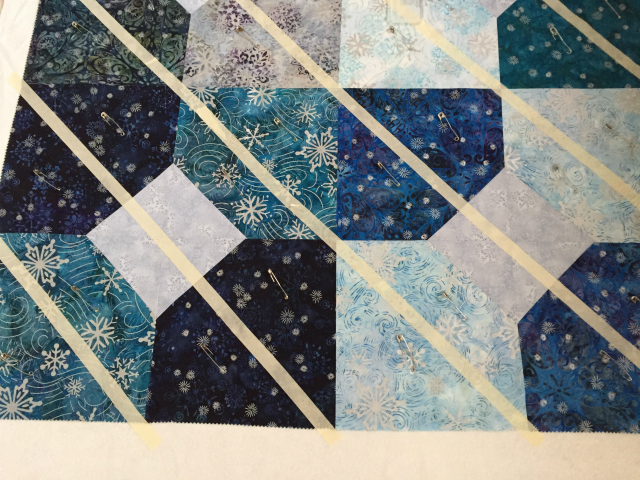 I love using precuts because they give your quilt the organized scrappy look. If you like to make your own click here for the tutorial.